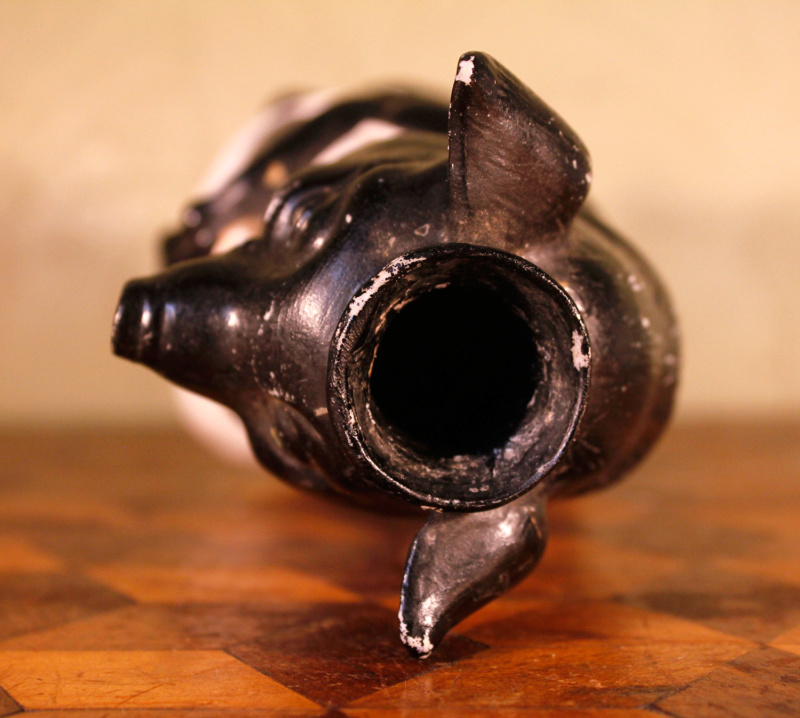 Unusual Old Bisque Black Pig with Knife Candlestick / Match holder? My wife and I recently discovered (and fell in love with) this very lovely unusual pig, but are struggling to find anything like it and would love some help with our research if anyone has any ideas? 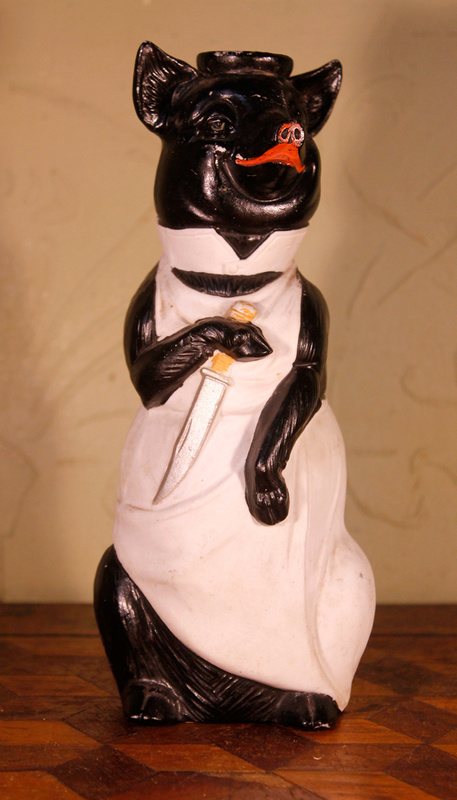 It measures just over 8" tall and is a somewhat sly looking painted bisque pig with collar and apron brandishing a knife! 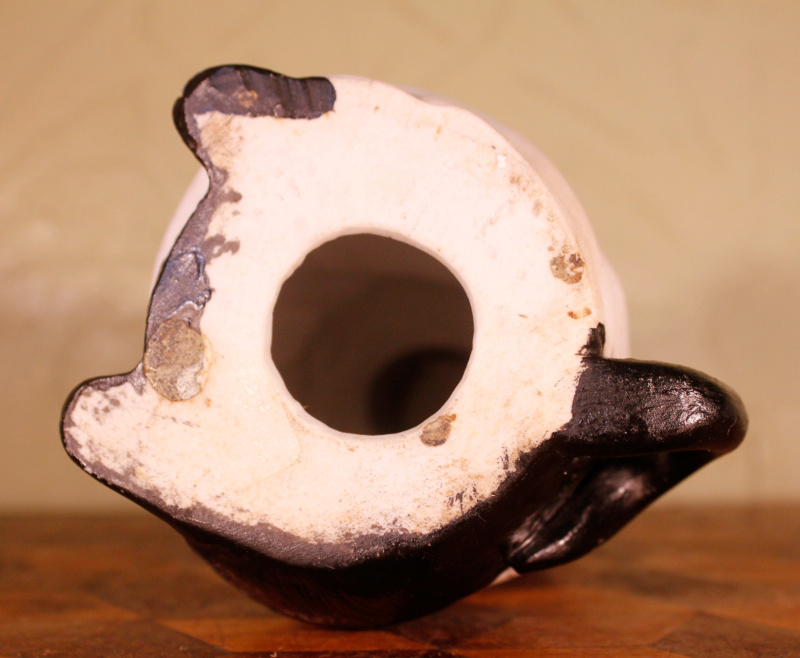 He has a 1 1/4" diameter x 1 1/4" deep hole in the top of his head- slightly snug but plausible as a candlestick or otherwise an oversized match holder? Or of course something we aren't thinking of? 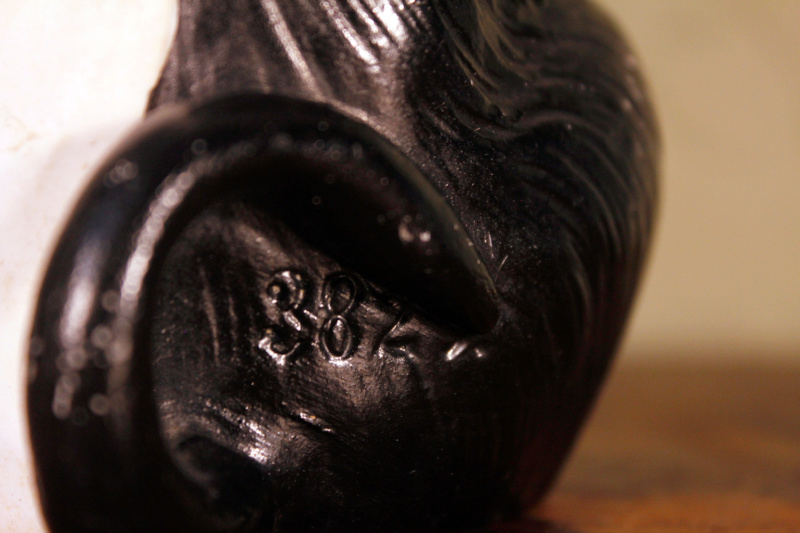 It has a registered number the back (3822) but no other marks as far as we can see. 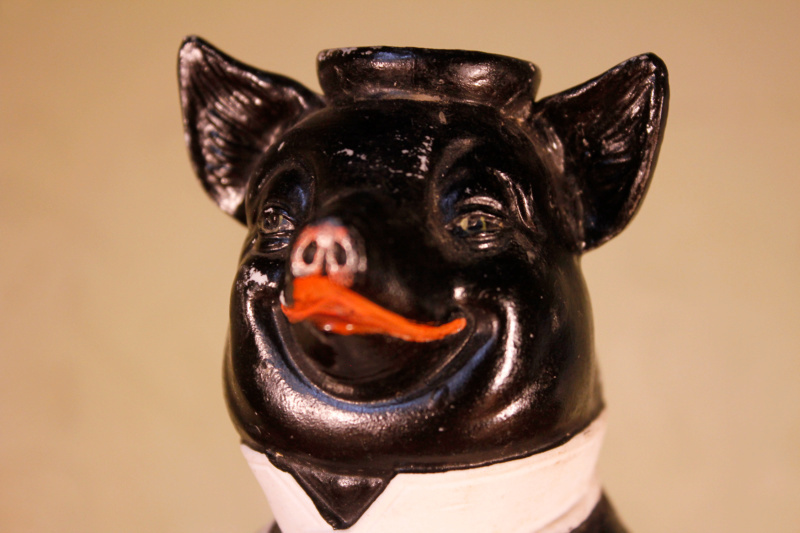 Re: Unusual Old Bisque Black Pig with Knife Candlestick / Match holder? Just a guess but maybe Bretby or one of the gerrman manufacturers? Art Deco period? I'd suggest that it is perhaps German or Bohemian, early 1900s, and more likely a liqueur bottle, in the style of Vater & Sohne. I find it a bit creepy. Perhaps George Orwell was inspired by one?! I also think Continental, Edwardian, but it is slipcast and has a hole in the bottom as well as the top, so not bottle. Thanks all for your thoughts- we thought probably German too but other than Schafer & Vater don't know of any other makers by name. I would like it to be Butchers piece though why there would be the hole in his head I don't know (the head hole has a base about 1" down much like a candlestick, but its a bit snug in width for todays candles)- the mystery continues. Any thoughts are as always appreciated! 22 Crawford St. wrote: I also think Continental, Edwardian, but it is slipcast and has a hole in the bottom as well as the top, so not bottle. Haha, how did I miss the hole in the base?! Too busy looking for the contents Simon! Don't think it's Bretby, I would be thinking German/Austrian. [quote="denbydump"]Too busy looking for the contents Simon! You taught me well, Jerry, you taught me well.